ECHOSMITH UNVEILS NEW SINGLE "TONIGHT WE'RE MAKING HISTORY"
Echosmith are Jamie, Sydney, Graham and Noah. Today Echosmith (formerly Read Set Go!) released their single "Tonight We're Making History," It's their first since signing to Warner Bros. Record label late last year. Comprised of siblings Sydney, Jamie, Noah and Graham, their name Echosmith translates into 'shaping sounds' just as a blacksmith shapes steel and metal. Pretty cool, huh? You can purchase this catchy single in iTunes right HERE. 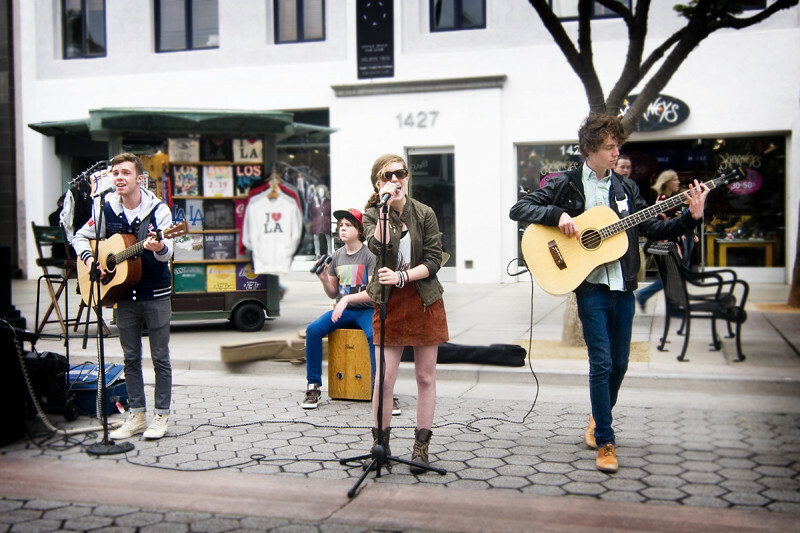 Echosmith performs on Santa Monica's 3rd Street Promenade. Of course, we remember the foursome when they performed weekends at Santa Monica's famed Third Street Promenade and from their amazing YouTube videos where they posted orignal songs and sang covers and mashups from artists like Jessie J, Fun, Gotye, Eminem and Rihanna and most recently Carly Rae Jepsen. Apparently, their new song can be heard on the latest NBC promos for the London 2012 Olympics. We haven't heard or seen it yet but when we do, we'll certainly post it.